“Fathers, be good to your daughters, Daughters will love like you do.” Those are the words John Mayer crooned on the chorus of his 2004 Grammy Award winning song “Daughters”. If those words are true, Chef Eric truly represents the ideal. 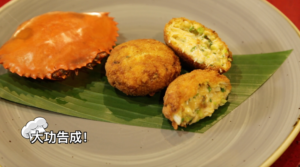 This article’s crab cake recipe is dedicated to his daughter, as it is her favourite dish. Chef Eric tells us that whenever she is feeling down, he would whip up this delicious dish to cheer her up. So if you are a father, put on your dad cap and get your dad game on! Cook this dish for your child and I guarantee a smile on their face. If you are not a parent yet, you can always treat yourself to some of Chef Eric’s delicious crab cakes. 3 packs of saltine crackers. 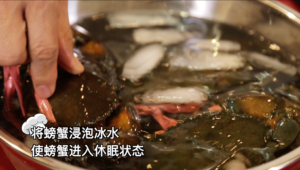 Place the crabs in a large metal bowl filled with iced water. This will stun them and keep them in a unconscious state. Take the two slices of bread and chop finely like the image below. 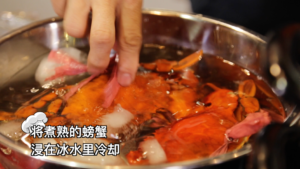 Place the crab in the steamer from medium to high heat. Leave in the steamer for 15 mins. The crabs should be bright red when done. Place them back in the iced water. After letting the crab sit in the iced water for a few minutes. 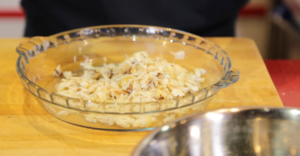 Take the crab out and start taking the meat out. 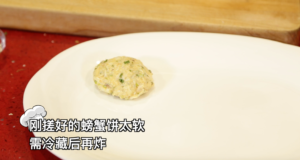 Pour the meat into a mixing bowl with the bread and scallion. Crack a egg into the bowl. Using a wooden spoon mix it thoroughly. Crush all the saltine crackers! While the saltine crackers are still in the packet, use your hands to crush it into small pieces. When finished pour into a separate plate. Add 4 tablespoons of mayonnaise, 1 tablespoon of Mustard, 1 tablespoon Cayenne Pepper, 1 tablespoon of Tabasco. 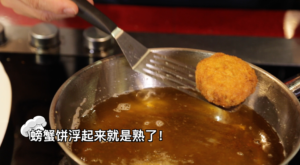 Using a metal spoon, mix the sauce till the texture is consistent. Add a dash of sugar, salt and pepper. 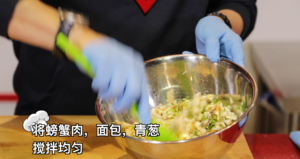 Pour the flavouring into the mixing bowl and mix thoroughly till moist. 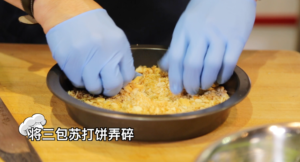 Using your hands mould the mixed contents into a 8 circle shaped patties. Approx. 6-8 cm radius. Place the patties into the fridge for 6 hours. Place three plates in this order: flour, egg yolk, and crushed crackers. Coat each crab cake with each plate’s contents in that order. ready to be taken out. Tell us how it taste and if you served it to your children, Did they enjoy it? Previous articleOmakase at Marukyu! : No Menu No Problem! Next articleWarung K: FIVE-STAR Ayam Bakar!